Why put Prince’s old sites back online? Prince has a rich and amazing history of using the internet to distribute his music directly to his fans online. Since his passing, there have been many tributes to his music, but we wanted to draw attention to his pioneering work online starting from the early days of the internet until now. It is also our hope to inspire other artists to find creative ways to reach their audience, as well as encourage current and future generations to use technology to build community and connect people through the arts online. Everyone involved in creating the Museum worked directly with Prince on the original websites. We have removed all of the music that had been for sale as well as taken all money transactions off the sites. This is a 100% free experience for display purposes only. We do not claim ownership of any of Prince’s music or images. This site is to merely show off the work we created, and to give fans a way to remember what Prince accomplished. Regarding the disclaimer: This is an all volunteer project, and there is nothing being sold, no money being collected in any way, or any downloadable music being distributed. We would love the opportunity to partner with The Estate of Prince Rogers Nelson to make this an official site that is in alignment with their plans and intentions. We sincerely hope an agreement can be reached. I see a timeline post, but where are the sites to click through? Each Prince site has it’s own timeline post. When you click the “Read more + access the site” button, you will get a detailed post which has a link to the working version of the site. Plus there are Q&As with the webmasters and other details diving in to some of the behind-the-scenes information for each website. I’m viewing the site on my phone and it’s not working. What’s up? The timeline itself is optimized for mobile, but the past websites are presented “as-is” and most of them precede the mobile web. Many of the websites use Adobe Flash, which is not compatible with phones. We’re sorry for the inconvenience, but this was the state of the web at the time of each sites creation. We recommend you get the full experience on a laptop or other computer. I tried to buy a [item] but the link/cart didn’t work. Can I buy the [item]? Sorry, no. All commerce has been disabled. We are not selling anything on these sites. The previous shopping carts are for display purposes only to show you what the experience was like. It will be up to the Prince Estate to decide what will be sold in the future. Where is the [site]? I want to see it again. We have most of Prince’s official websites covered. We have not included briefly-used one-page sites or third-party sites at this time. We might create a space for them in the future. We also have not heard from all the people behind some of his sites like TheDawn.com and 3rdEyeTunes.com. And some webmasters have decided to not participate. However, if there is a site we are missing and you can contribute, please email info@princeonlinemuseum.com. We would love to add more. I went to the NPG Music Club but couldn’t find the Mixer with the Downloads. Where is it? There are two versions of the NPG Music Club “Estate.” The 2003 version is the very first one and it does not have the Mixer yet. However you can see the Musicology Mixer in the ’04-’06 version of the club. The two versions are pretty different so we included them both for you to explore. However, all download purchasing has been disabled. We are not selling any Prince music from these sites. Prince was always very charitable. What charities does the POM support? Prince was a strong supporter of #YesWeCode, an organization that has a mission to connect 100,000 low-opportunity young adults to high-paying careers in technology. 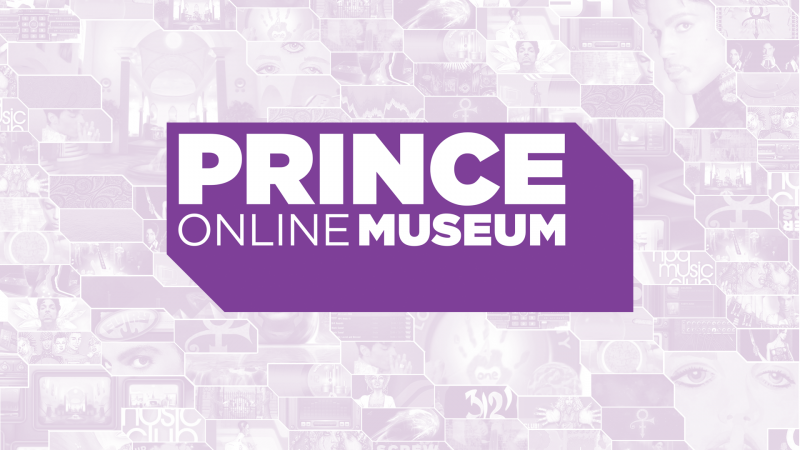 The Prince Online Museum is a supporter, and we encourage you to find out more about them. The Prince Online Museum also supports the PRN Alumni Foundation. The PRN Alumni Foundation, officially formed in 2017, is comprised of former employees of Paisley Park and the international icon Prince. The group’s mission is to continue the generosity of their late boss who supported opportunities for underprivileged youth to grow in music, tech, arts and education, and helped alumni members in-need. The foundation also supports urban farming initiatives that create sources of healthy foods where they are otherwise scarce. We encourage you to find out more about them. I found a typo and/or a broken link. Do you want me to let you know about it? Yes, please! This Museum is a labor of love and relies 100% on contributors volunteering their time while juggling jobs and family. We may have missed something, and any help we can get is greatly appreciated! Please email info@princeonlinemuseum.com. One last question, who in this house know about the Quake?